It is no secret that in my other life I am a writer. (Unless you didn’t know that, in which case it is a well-kept secret.) It is also no secret that there are those who have said that no video game can ever truly be art. (Again, unless you didn’t know that, in which case this is a real learning experience for you.) 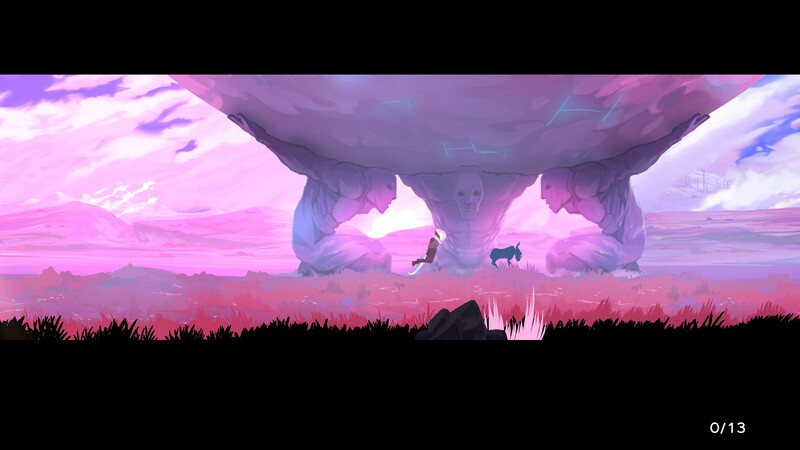 Elegy for a Dead World is a game that combines my two favorite pastimes and devotes all of its focus to creativity and expression. For a dead world, it sure has a lot of grass and Circle-Elks. There are few games where the visuals are more important than Elegy. They serve as your primary source of inspiration, and inspiration is effectively the entire point of the game. Your player character is fairly simple and anonymous, a space-suit-clad explorer venturing through portals to strange worlds. These worlds, however, are incredibly rich masterpieces of color and form. Each one is distinct from the others, tracing out what remains of a civilization now devoid of its people. Alien architecture, devices of unknown purpose, drifting artefacts, and towering monuments unfold before you in sprawling, scrolling panoramic vistas. Though the game is played in 2D, the multilayer backgrounds, depth of field blurring, and subtle effects all give the visuals depth and detail that makes it seem to stretch the horizon. Existing as it does to inspire the answers to writing prompts, or to encourage you to create your own freeform story, the visuals are in a way arranged with specific landmarks and points of interest. You seldom have to walk for long before something that stands out as truly interesting presents itself. And it should be said that the visuals are anything but random attempts at being alien. Each portal in the entry area leads to a world with many common visual threads, running themes that suggest what sort of people might have lived there before you’d arrived. And though the game is ostensibly about dead worlds, each one feels like a living, breathing place. Some even have wildlife that bolts when you draw near. I really can’t come up with anything negative to say about the visuals in this game. They accomplish what they set out to do: create an environment to conjure narratives in the minds of the player. 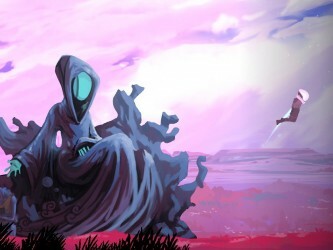 There is likely to be some debate about whether or not Elegy for a dead world is truly a game. After all, most games present you with a definite goal. Obstacles are placed between you and that goal that challenge you, and more often than not you are scored on your capacity to complete those goals before ideally reaching the end of the game. Let’s see if Elegy fits the bill. You play as an explorer visiting depopulated worlds. Each one has a number of writing prompts you can select from. If you select one, you enter the world and find, scattered along the landscape and within the various structures, little quill icons. Pressing Tab opens a scene prompt. Perhaps you’ve selected an overall prompt based upon the premise that you are describing this world to someone who you believe would like it. Each scene prompt will offer open ended sentences to complete. “In some place it is good, there are ______. Other places are worse, _____.” Your job is to fill in the blanks to tell your own story. If the blanks don’t quite suit the story you want to tell, you can delete some or all of the prompt and fill in what you please. Once you’ve fully explored the world—something indicated by the number of remaining prompts, the closest thing this game has to a scoring system—you can leave the world, naming your story and sharing it for others to read. If this is too restrictive for you, you can play each world in freeform mode, which has no prompts, allowing you instead to drop your own and write whatever you please, completing with the same option to save and publish your elegy. There are no rules, no decision if you’ve done a good job or a bad one. The game does not judge or interpret your writing or punish you for not taking it seriously. It need not be serious. In the same setting you can be an emperor trying to give your people hope in their darkest hour, or you can be a construction worker looking over the abandon planet and poking fun at the architecture. So does this count as gameplay? Well, there is a goal, and that goal is to write an elegy. There are obstacles to challenge you, and those are the grim specters of writer’s block and grammar. The score is presumably how entertaining or intriguing a tale you are able to create. So yes, I’m willing to call this a game, and a fun one. But then, I’m a writer. The audio in this game serves quite the same purpose of as the video, building the setting and giving you a sense of what sort of an environment this is. Overall it is powerfully atmospheric, and when combined with the visuals can produce some surprisingly intense emotional payloads considering there is no real danger in the game. Bizarre, unidentified tones. Distant, desperate breathing. Things that might be animal calls. Even the wail of the wind and the patter of rain all give texture to the worlds. That’s up to you. My game had a dozen stories before I decided to write this review. Yours might have a thousand before you call it quits. Often, if a game perfectly achieves what it sets out to do I will give it a perfect score, but I know that many people will find this game unfulfilling or pointless. It simply isn’t for everyone. But for the sort of person who spent every free moment in high school jotting down ideas for stories, this is a phenomenal artistic outlet. 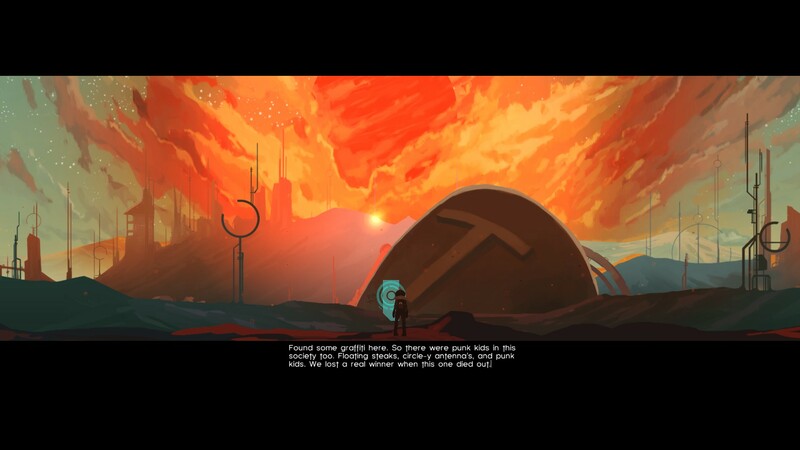 9.5 / 10: To some, Elegy for a Dead World will be a homework assignment. To writers, it is catnip.